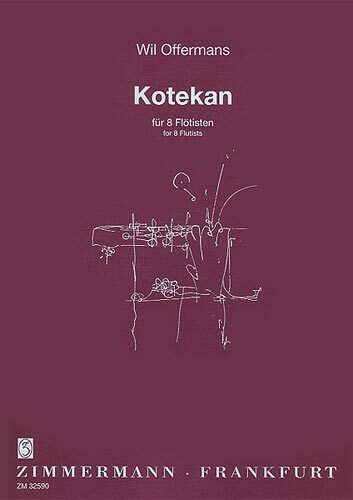 Kotekan is a most exciting composition by Wil Offermans for eight flutes based on Balinese interlocking techniques. 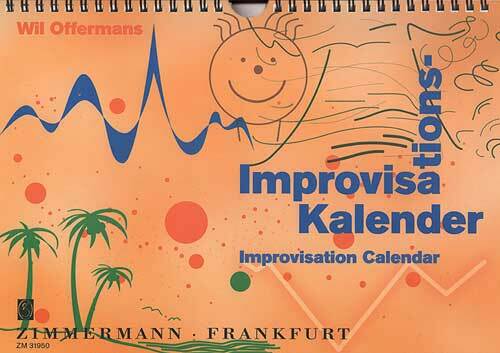 In the wonderful world of non-western ensemble music, we can hear some most fascinating samples of collectivism. 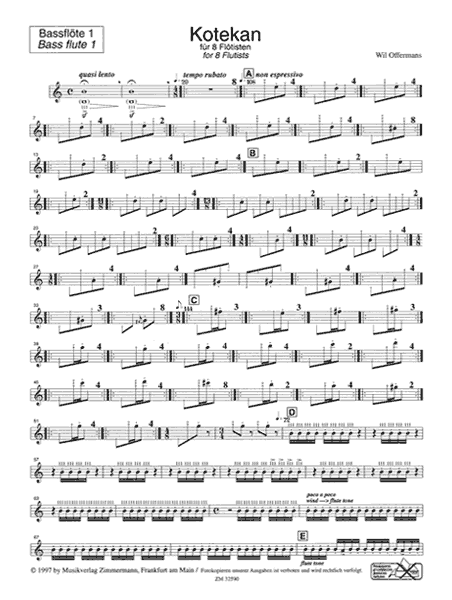 Here, usually each player performs a relatively simple pattern, rhythm or motive, which - on itself - seems without much musical value. However, once performed in the ensemble it becomes part of some sensational and enigmatic music. 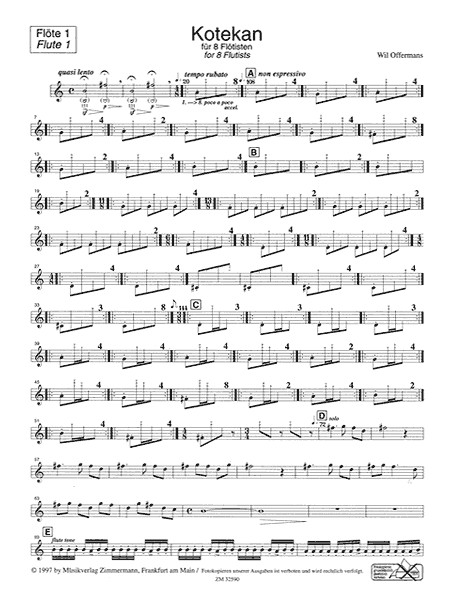 With the idea to integrate non-western ensemble techniques into the contemporary flute ensemble and with a focus towards Bali, Indonesia, I first composed three short studies for flute ensemble. 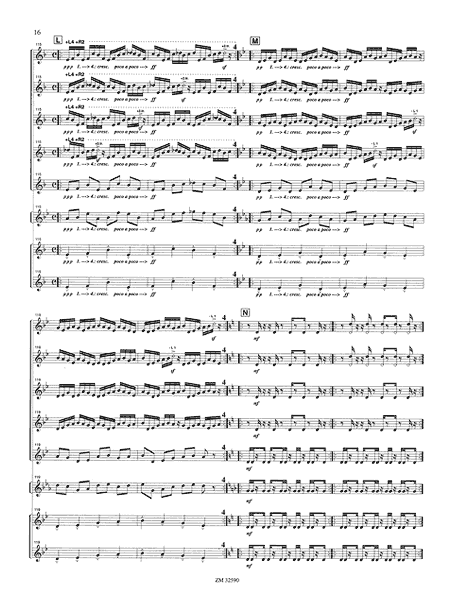 These were based on techniques like canon, interlocking (a pattern or melody is divided amongst various parts) and kecak (the Balinese Hindu-legend monkey dance, with dazzling vocal interlocking). Kotekan (= a Balinese interlocking technique) has been created as a sequel to these three short studies. 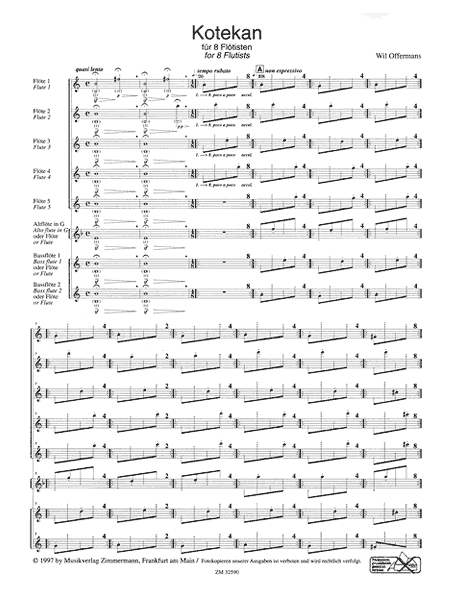 Kotekan involves some contemporary flute techniques like wind tones, harmonics, and bamboo tones as well as a non-western approach concerning ensemble playing. Here, beauty can merely arise from the enjoyment of the elusive nature of the collectivism. 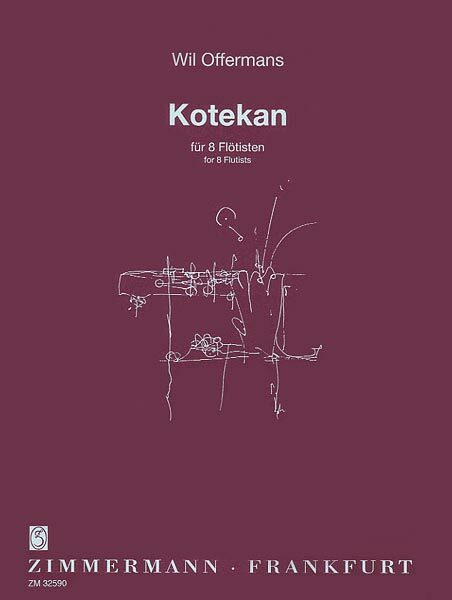 - Kotekan has been recorded by Wil Offermans at the CD The Magic Flute (CDE-971 / E-records).